iman couples 457 visa health insurance comes from a health fund that is now 25 years old and offers numerous viable options for overseas visitors. With an array of sustainable and affordable health care solutions for couples, the iman health fund meets many needs of visitors–specifically those in the country on 457 work visas. This health cover is a subsidiary of nib and is listed on the Australian Stock Exchange under NHF. iman was purchased in 2010 for an estimated $25 million AUD’s. Before this acquisition, iman was better known to visitors as: International Medical Assistance Network. Currently, there are well over 1,000,000 members, illustrating this is a dependable health cover solution for most couples. Take a look at the comparison chart listed below to learn how this is one of the more competitive for singles, couples and families alike. Is IMAN Suitable For 457 Visa Health Insurance? iman couples 457 visa health insurance is one of the select few that specialises in meeting the strict conditions of 8501, while also consistently providing more than adequate health cover options for many couples visiting Australia too. Clearly, having the ability to access a health fund like this gives visitors peace of mind, because they can know they’ll have no issues meeting all of the Department of Immigration requirements. Putting the icing on the cake here, iman is extremely affordable and has very little, if any, excess costs to the member. Below shows our singles comparison. When speaking about the private and public hospital cover options, iman provides 100% cover for treatments and services while in the hospital. For couples, this budget cover gives them the peace-of-mind they need while visiting a foreign country. It is also appealing for visitors to receive their visa certificate within only 48 hours of approval from the cover! Once again, when visitors compare the various prices and features of multiple health funds they will find that iman remains affordable, even with additional features added on to a health cover. 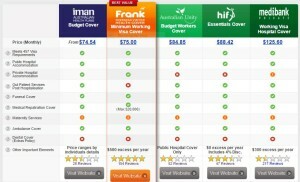 Frank’s health is a close competitor to iman, and is the only other Australian health fund that specifically focuses on offer overseas visitor appropriate health cover options, as the illustration below demonstrates. There is only a slight cost difference, but features and benefits do vary among policies. Applying for your working visa takes steps, and one of the most important lies in showing you have proof of adequate 457 visa health insurance cover. Thankfully, iman meets all the requirements established by the Department of Immigration. Once your application is approved you receive your certificate of approval in no more than 48 hours! No matter what cover a couple might choose, iman provides public and/or private coverage for a hospital stay. Many other funds have stringent conditions tied to this, but only iman gives that stress-free promise. If you require a trip by ambulance iman provides the cover for these medically necessary trips and there aren’t any waiting periods either. If the unexpected were to occur you are covered! iman couples 457 visa health insurance promises a policy holders full funeral expenses will be covered. Further, all costs are paid to have the body (or ashes) returned to the policy holders country of residence. There are some waiting periods and exclusions tied to this, but they are minimal. Visitors will be guaranteed to receive a refund for any premium, or portion of one when they travel overseas for more than 4 weeks. The waiting period for this benefit is one month following membership. iman provides a unique feature to members that allows them to return to their home country when it is deemed medically necessary. An iman medical practitioner makes the final call on this, but when approved a member has free airfare and all medical treatment and other services are totally covered. What Are The 5 Key Advantages Of IMAN Couples 457 Visa Health Insurance? iman is one of the more competitive policies for singles, couples and families. iman also provides extra cover options such as optical and dental services. The waiting periods are very minimal and if hospital treatment is necessary due to an accidental injury there is no waiting period at all. However, rehabilitation and palliative care services have a 2 month waiting period. Pre-existing conditions are governed by a 12 month waiting period. Members of iman have no hospital excess fees for an overnight stay in a private, or public hospital. If intensive care is necessary, couples don’t have extra costs for this either. iman members are guaranteed a credit when they are traveling overseas for a 4 week period– at minimum. The only requirement is to be a member for at least 30 days to receive this plus benefit. iman is one of the older health funds so comes with a pioneer experience. This is now a subsidiary of nib, backed by one of the largest Australian health funds.